Why Choose Our Water Shoes? The soft outsole is made from elastic thermoplastic rubber, which enhancing skid resistance and protecting you from slipping. 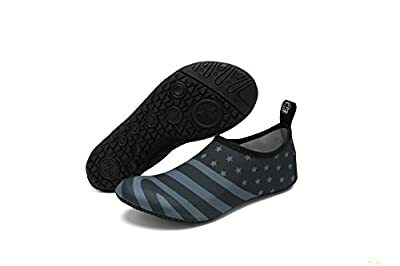 New fashion water shoes are breathable, smooth fabrics and sweat-absorption, it is comfortable, quick-dry. The whole water shoes are soft, elastic and can be bent as a small piece, which is easy to carry. VIFUUR Skin Aqua Shoes Yoga Exercise Socks come with a wide range of styles and color for you to pick out for family day. Recommended 1: CONVENIENCE - Smooth neck design prevents chafing when wearing our water shoes. It is convenient to wear and take off. Recommended 2: COMFORTABLE FIT -- Breathable and smooth fabrics with fine stretch on uppers. Like socks, flexible and comfortable. Recommended 3: RUBBER OUTSOLE & FOOT SAFETY -- Wearable and top-quality rubber sole, which protects your feet from being hurt by sharp objects. Recommended 4: OCCASION - Yoga Training, beach, swimming, pool, weight training, wake-boarding, sailing, boating, kayaking, windsurfing, cycling, jogging, walking, fishing, beach volleyball, gardening, lawn, car-washing and driving. Family outings! Tips?VARIOUS SIZE AVAILABLE -- fit different feet,little kids, big kids,men,women are available.